Researchers have used gene editing to completely eliminate populations of mosquitoes in the lab. The team tested their technique on the mosquito Anopheles gambiae, which transmits malaria. They altered part of a gene called doublesex, which determines whether an individual mosquito develops as a male or as a female. 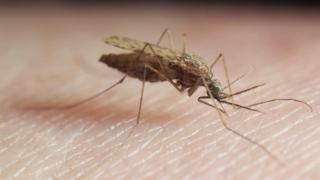 This allowed the Imperial College London scientists to block reproduction in the female mosquitoes. They want to see if the technology could one day be used to control mosquito populations in the wild. Writing in the journal Nature Biotechnology, Prof Andrea Crisanti and colleagues report that caged populations of Anopheles gambiae collapsed within 7-11 generations. Dr Crisanti said: "2016 marked the first time in over two decades that malaria cases did not fall year-on-year despite huge efforts and resources, suggesting we need more tools in the fight." The approach falls within a category of genetic engineering known as a gene drive. It describes technologies that spread a gene or particular suites of genes through a population. The researchers used the gene editing technique known as Crispr to modify a part of the doublesex gene that is responsible for female development. Males who carried the modified gene showed no changes, and neither did female mosquitoes with one copy of the modified gene. However, female insects with two copies of the altered gene showed both male and female characteristics, did not bite and did not lay eggs. As the modified gene - which confers female infertility - spread, the caged populations crashed. However, previous attempts to use this approach in mosquitoes ran into problems: the insects developed resistance to the genetic modification. This occurred because targeted genes developed natural mutations that allowed them to continue functioning, and these mutations were then passed down to offspring. However, the doublesex gene is highly "conserved", which means that random mutations are for the most part lethal to the organism. In this way, the scientists were able to sidestep a potential source of resistance. The researchers now want to test the technique on larger populations of mosquitoes confined in more realistic settings, where competition for food and other ecological factors could affect the outcome. Prof Crisanti commented: "There is still more work to be done, both in terms of testing the technology in larger lab-based studies and working with affected countries to assess the feasibility of such an intervention. "It will still be at least 5-10 years before we consider testing any mosquitoes with gene drive in the wild, but now we have some encouraging proof that we're on the right path. "Gene drive solutions have the potential one day to expedite malaria eradication by overcoming the barriers of logistics in resource-poor countries."